"We study fifteen months of human mobility data for one and a half million individuals and find that human mobility traces are highly unique. 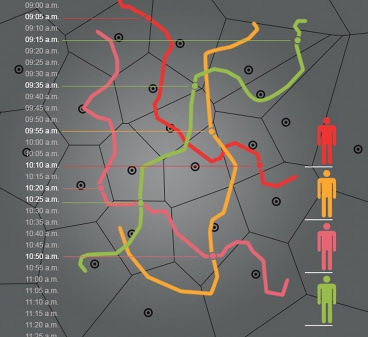 In fact, in a dataset where the location of an individual is specified hourly, and with a spatial resolution equal to that given by the carrier's antennas, four spatio-temporal points are enough to uniquely identify 95% of the individuals. [...] even coarse datasets provide little anonymity. These findings represent fundamental constraints to an individual's privacy and have important implications for the design of frameworks and institutions dedicated to protect the privacy of individuals." Several nice pieces have explored the implications of this work, including the BBC's Science and technology reporter Jason Palmer's Mobile location data 'present anonymity risk' and MIT's own Larry Hardesty asking How hard is it to 'de-anonymize' cellphone data?